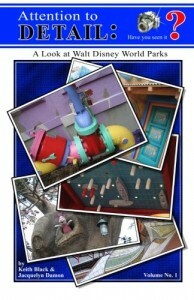 Attention to Detail: A Look at Walt Disney World Parks, by Keith Black & Jacquelyn Damon, Keith R. Black, 2010, 76 pp. What do you see when you walk around Walt Disney World? Keith Black and Jacquelyn Damon think you are missing more than you realize. 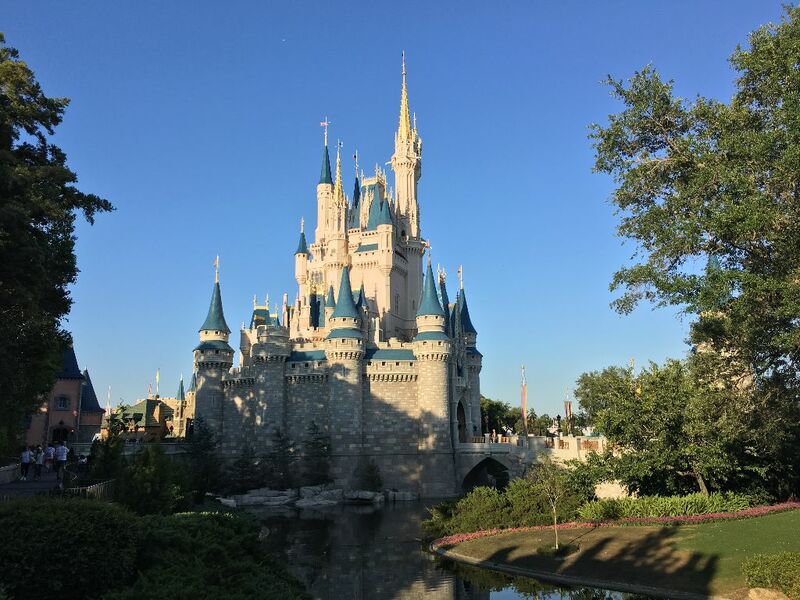 The concept behind Attention to Detail: A Look at Walt Disney World Parks is that the average WDW visitor simply does not ever get beyond a superficial understanding or appreciation of the history and detail of the Disney parks. With the release of Attention to Detail, Black and Damon hope to encourage visitors to take the time to look more closely at the subtle and often hidden elements built into the parks by Disney Imagineers. Although the goal of Attention to Detail is hardly groundbreaking—others have sought to bring attention to the vast and understated hidden details of the parks—the concept and approach is unique. Black and Damon guide the reader through Walt Disney World by challenging the reader to identify the park, area, and specific location of park details depicted in each of 99 color photographs. In doing so, the authors test the reader’s memory and knowledge of Disney park details and encourage a more careful exploration of the parks in the future. As in the increasingly popular “Where in the World am I?” game played daily on social network sites, many of the photographs are not easily identifiable and require either a savant-like knowledge of the parks or some serious detective work. The photographs are separated into three levels that test the reader’s knowledge of distinct and increasingly specific kinds of detail. In Level 1: The Weenie Level. Photographs focus on buildings, structures, and general park elements designed to draw the visitor into a particular area of the parks—weenies in Disney-speak. For Level 2: The Prop Level. The concentration is, not surprisingly, on props and the placement of smaller design elements throughout the parks. These are the details that more definitively establish a location and begin to draw the visitor into the story associated with the location. Finally, in Level 3: The Pixie Dust Level. The emphasis is on images, details, and story elements that escape the notice of all but the most seasoned Disneyphile. For those seeking even more adventure, the book contains a Magic Kingdom and four-park Scavenger Hunt, both designed to encourage even more exploration. In Scavenger Hunt, Black and Damon provide 33 generic phrases such as “ready, set, go!” and “dreams come true” and challenge the reader to photograph something in the parks that depicts, represents or in some way captures the spirit of each phrase. At 76 pages, Attention to Detail can be tackled in a very short time, and, even when not involved in the book’s many adventures, the photographs are sure to bring you back to your favorite Walt Disney World locations. Contributed by: John Marchese (NDD#172) John is the DDL Media Relations Blogger.